Over the weekend we had a Super Bowl party. There were multiple people and a TV larger than 55 inches -- that's apparently actually illegal. But being the non-sporting people that we are, the entertainment during the second half was some experiments with molecular gastronomy. I've been told it isn't hip to call it that. But whatever. We made a peanut butter "dirt" using Tapioca Maltodextrin and two kinds of "caviar" via droppers. These are both very simple first steps with this type of "cooking". An easy (although expensive if you start doing lots of it) source for the chemicals is willpowder.net. The other thing you are likely to need is a very accurate scale -- one that can weigh in tenths of a gram. anne posted some pictures. Here's an especially nice looking one of the coffee caviar. While I was trying to find out names for various cuts of chuck roast (and boy are there a lot of them! ), I ran into this web site with some great information. This is great. The next time you go out bird hunting, you can inject flavor into the beast at the very instant your bring 'em down! Shotgun shells made out of spices! One of the dishes we made for the summer party this year was a simple plate of grill seared scallops and a tomato vermouth beurre blanc. This dish resulted in one injury and an almost failure, so it's worth pointing at least the later out. The burn was my own fault, after re-stoking the grill with charcoal I picked up the grate to place it on the grill. Bare handed. That was fine for the side that hadn't been on the coals. Less so for the other hand. It's recovered now, but looks pretty gnarly for a while there. I've made beurre blanc sauces so many times now that I've gotten pretty cavalier about it. This is both good and bad. It's good because I know I can add one to a menu with fairly little thought. It's bad because when you take a recipe and start playing fast and loose with it, you need to know why it works in the first place, and what to do if something goes wrong. Beurre blancs are a class of emulsified sauces that make use of the natural emulsion that's in butter itself. Butter can be thought of as fat and water, but something is keeping them together rather than broken apart like bad oil and vinegar. As long as you heat butter gently and not too high, the emulsion that's there remains and the sauce is smooth. Heat too fast, or too high, and the butterfat comes out of the suspension and you have a greasy pool on top of your sauce. The other thing is that unlike sauces that make use of melted butter and another emulsifier (such as egg) you can't have too much butter in a beurre blanc. Why? Because the butter itself is the sauce and emulsifier! All of the other things are just flavorings. The flavorings will obviously become muted as you add more butter, but the sauce won't break or fail because of it. For the party, I had the half-pound of butter that goes into this sauce prepped and ready. This is how we normally do things at the party, and so it was sitting there until it was time to make the sauce. Several things set up for the potential disaster, however: a) the butter was out for several hours and it's summertime. That means it was already very close to being a sauce. b) I was at least partially distracted by the aforementioned burn. c) the party had been going for a while. Let's just say that there was less wine outside of me than there was earlier in the day. The scallops were off being grilled and I had the gastrique being reduced and ready to go. Once I hit the right reduction point, I dropped in the tomato paste, stirred to heat, and was ready for the butter. OK. Pan's too hot because you normally reduce fire to low or off before adding butter and wait a bit (but I hadn't). Butter's way too soft. I'm in a hurry (those scallops are coming off any second) and drop the entire half pound in at once and start stirring. Whoa! It's clearly melting way too fast. Kill the heat. Stir like mad and watch in horror as the sauce hovers for five minutes just shy of breaking. Only luck, the stirring, and moving the pan completely off the stove so no more heat was being dumped in from the grate kept the sauce together. - don't add all the butter at once. If you put in a tiny bit and see that things are too hot, you can stir and wait until things cool down. - don't have the butter already melting. It doesn't have to be rock hard either, but kitchen are hot in the summer, ya know? - have some ice chips handy (I usually do but, well, I think there was some wine or something). Tossing in one or two can very quickly cool a sauce if needed. If I'd completely broken the sauce I could have started over. I had more vermouth, garlic, and tomato paste (and butter, of course). If I needed to rescue the gastrique (say I had no more vermouth), you can spoon off the grease, check temp, and start back in with fresh butter. It isn't quite the same, but it does work. We had fantastic summer party with lots of our friends. The long weekend ment that some regulars couldn't attend, but we got some great photos of what they all missed. anne got lots of action shots of the preparation (and us being goofy with the Guitar Hero video game). She also decided that we needed some more "pig" related decorations. The cream cheese pig and vegetable cut pigs were all her idea. I'm especially impressed with the pig-cut-out then re-inserted into the carrot. Melissa showed up with the fancy camera again. Tim's new job means he also had to get a fancy camera. He decided to go for a more "art" type shoot this time. I think some of these turned out really nice. "First they came for the foie gras. 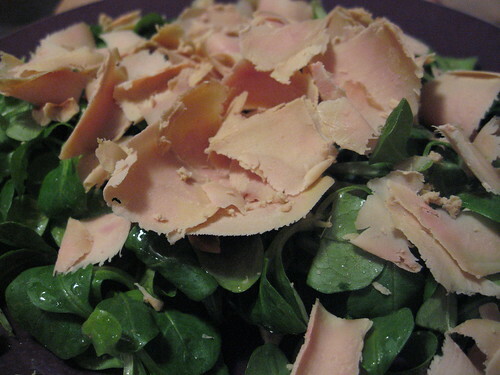 because I did not care for foie gras. because I was not really a big pork fan. because I was not much of a drinker. and the great war began." My CEO's other company has a trailer out for their next project. It played before Cars when we got to see that film today.. I happened to find said trailer as it was shown in France a while back. My French is pretty rusty, but I couldn't help but love the line: "Je ne veux pas manger la poubelle, papa." The trailer in French is here. You'll need to know at least enough French to navigate the web site, or click on "Grand" next to the QuickTime logo. Babies are very curious about adult beverages. I don't know why I find that picture so funny. But at least they have the good sense to offer their child an appropriate quality beer. Looks like Anchor Steam to me. 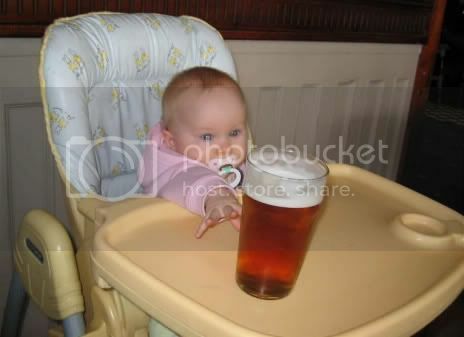 And, no, before sending me hate mail, I do not approve of actually serving beer to children. Just teasing them with it. There's lots of theories about the results of the famous 1976 Paris wine tasting. But if nothing else, it did bring California wines into the world scene. I'm sure many think that the results are more because of flukes or marketing or just plain dumb luck on the part of the Americans. Kinda neat, because Ridge is about 10 miles from my house (albeit up one of the smallest and winding roads you'll find in California). anne and I went to Walt Disney World. On the way back, we were discussing which ride was our favorite. I think for me it was Mission: Space. Lots of fun, and I'm not sure what all of the fuss is about -- I'm prone to motion sickness, but didn't feel even remotely light-headed. It was overall a neat ride, even though we only rode it once. Everest was also fun, but not worth the heat and humidity of Animal Kingdom to get there. But my favorite ride just has to be the Wine and Steak Ride. Okay, so that isn't at Disney. It's Bern's Steak House in Tampa. We went there the day after we got back from Disney. Bern's is an old-school place. Sort of what someone might have thought was "fancy dining" back in the 1950s. Viewed this way, it's just this side of tacky. But if you get yourself into the right mindset, the interior is then fun, the extra food doesn't bother (just don't eat all of the soup or salad), and the separate booths for desert and after dinner drinks are charming. However, you shouldn't be there for any of the above. Bern's is really about two things: steak, and wine. The steak is a selection of cuts from the strip sub-primal (filet, strip steaks, porterhouse, and other related cuts). They offer both aged and non-aged versions, and have an exact cooking chart with many exacting degrees of doneness. More importantly, their grill guys have been doing this so long that they can actual pull off the precision. anne and I both got aged 10 ounce Chateaubriands, with hers having a cool center and mine a slightly warm center. And that's exactly how the steaks were cooked. Oh yeah, they also have a wine cellar. It's hand-down the largest wine list I've ever seen. It must be the largest in the States. I can't imagine any larger in the world, but I suppose it's possible. I've been told that they have 5 warehouses in the Tampa area to hold the back-catalog for the list. While it's fun to go through the list yourself, this one is really so large that that's hard to get your own head around. Time to call on the wine guy! We gave him a country: France. A grape: cab-based. An age: "something with age on it." And a price range: well, never you mind. It was expensive, but was not the most expensive wine I've ever bought, nor was it out of line for what we ended up with. 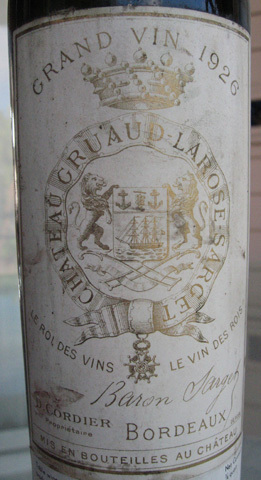 A 1926 Chateau Gruaud-Larose-Sarget. This is a "super second" growth that Bern's managed to buy up a whole bunch of about 30 years ago. Did I mention that the cellar also has lots of old wine? 1926! Holy Cow! We would have never in a million years thought to try to get wine that old. That's older than me and anne put together! What's drinking an old wine like that like? It's hard to describe. It was in very good shape, with red only slightly tinged towards brown. The flavor had cedar or other aromatic wood notes, and as the wine started to open up, there was actually fruit like cherry, and even a bit of tanins left. I'll never again in my life probably drink wine that old -- but it sure was a neat ride even once. I've been watching the new Bravo show "Top Chef". While it contains the usual "reality" drama, it's interesting because the judging is set in San Francisco. This means that the guest chefs and judges are often from places that I know and respect. A recent show had a competition based upon a fruit plate. I called out early that several of the chefs would be down-pointed for using the top of the pineapple as part of their plating. That's called "non-functional" garnish, and was a common theme when I was at the CIA. At least nobody put tomatoes on their plate. There's been a meme on the web for a while now that says that if you take cheap vodka and run it through an ordinary pitcher-type water filter several times (around 8 or 9) the result tastes like higher end vodkas (such as Kettel One). anne and I tried this out last weekend. We used a Brita filter as in the above blog, along with some really cheap vokda that's made in San Jose, CA. Yikes! Unlike the above experiment, we kept a shot of vodka from each pass through the filter along with the original pre-filtered, but were not drinking the vokda during the test. Long story short: after 4 or 5 passes the quantity of bad smells did in fact reduce down the Kettel One quantity. However, the quality of those smells remained the same -- that of rubbing alcohol. Side by side, it was easy to tell the difference, even after 15 passes (at which point, we got tired and stopped). It makes sense that this doesn't work -- there are impurities in cheap vodka, but some of them are in the form of higher alcohols/esters that aren't going away by running through a filter. Kettel One is about three times the price of this cheap vodka, but it's worth it unless you are consuming more vodka than you probably should be. But if that's the case, you probably wouldn't even mind the taste of the original unfiltered. And let's not forget that the filter cost $6, and it takes about 15 minutes for each pass through the filter. Only because I haven't posted anything in a while, and managed to find this great machine while surfing on the Internets (I use all 10 of them). Well, here's a very nice little entry that meriko pointed me at. In return, I probably should get to posting something a bit more regularly here. So far, winter has consisted of far too many slow cooked stews. They've been mighty tasty, but I'm sure that even if I had bothered to take pictures, they would all look rather similar. We found entire racks of beef ribs the other day, cryovaced in twos, for $10 per two! Four of them are sitting in my freezer now, and I think next weekend it's time to start the BBQ season. 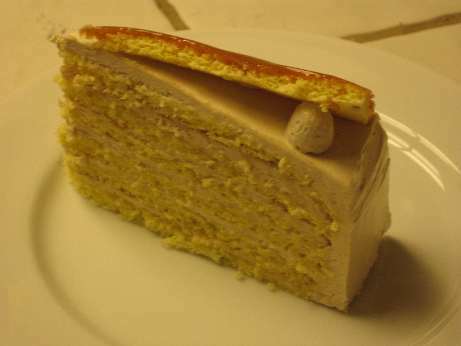 Dobos Tort is a nice cake. But it is a fair amount of work. It's a basic sponge cake with 6 layers, butter cream between each one, and a final layer on top that is coated with caramel prior to being cut into wedges and then afixed to the top with a dot of butter cream. 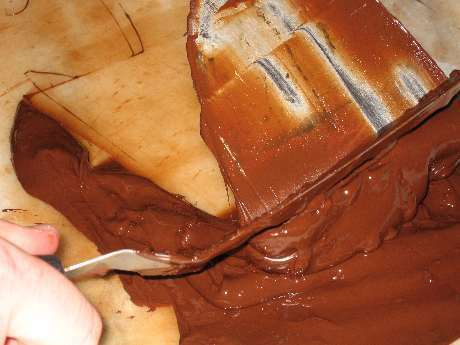 Like with many cakes, the layers are moistened with a simple sugar during assembly. We used a bourbon flavored syrup this time, as it goes nice with the coffee in the buttercream. The most interesting part of the Dobos Tort is how the sponge is made. It's a basic normal sponge made via the separated foam method (which means yolks and whites are processsed separately). However, the batter is spread directly into 7 circles, 10 inches each. This gets you nice and even layers, and you don't need to slice the cakes afterwards. It does, however, mean you need 7 half sized sheet pans for each cake, or you need to do them in two batches. My oven can just barely hold 4 pans at a time via some creative positioning. 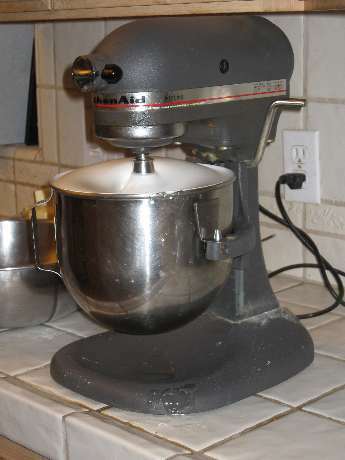 I make butter cream via the "swiss" method, which basically means making a meringue. The egg whites are whipped to soft peaks and then hot (242 degrees F) sugar syrup is poured in. The whites continue to whip until completely cool. Note that the quantity I was using just barely fit into my Kitchenaid. Nope, it didn't go over the edge. However, the butter needed to be whipped in via two batches. Then the resulting buttercream needed to be stirred together, and finally the coffee flavor (visible next to the butter below) added. This all would have been easier if I had a 12 quart Hobart. But no home cook in their right mind normally makes 5 pound batches of buttercream. Coffee flavor is made by boiling down coffee and sugar until a very very thick syrup results. The sugar actually carmelizes, which is part of the flavor. You want very little water to remain so that you don't break the structure of the buttercream once you add it. 3 pounds of butter. William. "Should I cut this up so it softens faster?" "Sure, that would be great." 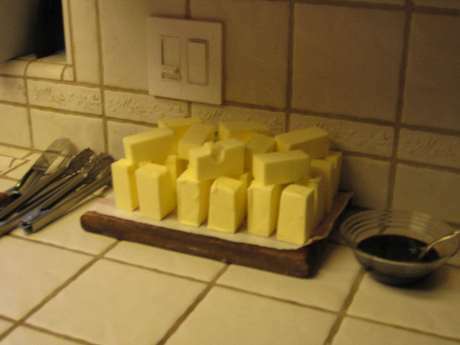 Never leave your cooks alone without explict instructions, or you too shall have a stonehenge formed from butter. I think every single person with a camera photographed this. It was just too great not to. Yet another great party idea. Clafouti are basically a baked souflee-like batter-based dessert. It's a fairly loose batter poured into a pan and then baked in a fairly hot oven. The result comes out not unlike "Dutch Baby" pancakes (sort of puffed up and brown). Usually some form of fruit is put into the pan before the batter. 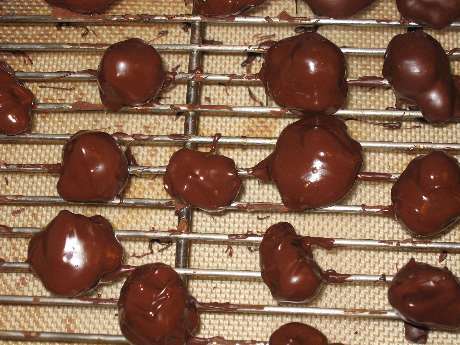 We made two kinds, a sour cherry (using jars of Morellos from Trader Joe's) and prunes re-hydrated in congac. Prunes are usually used in a very similar desert is known as a "far". 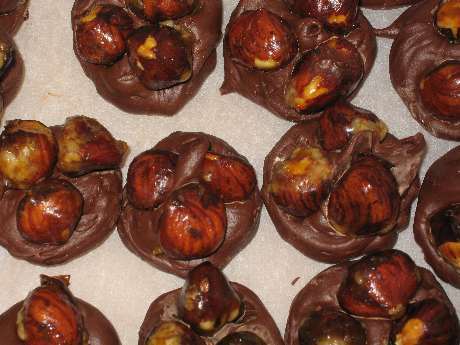 In addition to being quick to make when the time comes, it's a fairly unusual dessert for most Americans. It's always fun to serve something people haven't had a million times before. I just did a google for a recipe for this one, and here's what we used as a base. As typical, we simplified this a bit, and just tossed all of the mis into the blender and whapped it up when the time came. We also used basic powdered sugar for the final dusting, which we placed into a little cheesecloth "bag" as part of our prep. Preheat oven to 400 degrees and butter the pie plate well. with vanilla sugar and serve at once.